Tattoo World Book by Marisa Kakoulas and Michael Kaplan, which was released a few month ago, features some of my black and gray animal portrait tattoos. 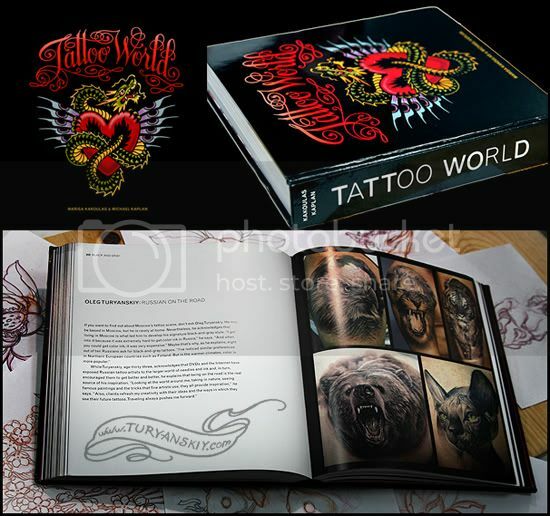 This hardback book includes more than a 1000 illustrations from 125 tattoo artists from around the globe and represent different tattoo styles on 384 pages. I also want to add that it was honor for me to be a part of this project which came out fantastic. You can find some useful links bellow. Needles and Sins tattoo related blog by Marisa Kakoulas and some info about Tattoo World book. A few links where Tattoo World book can be purchased: Barnes and Noble, Amazon and Easons. French translation is available here.